The Diocese of Balanga was established on March 17, 1975. It comprises the entire civil province of Bataan, the smallest among the provinces of Central Luzon. The province is a peninsula jutting out to sea, with Manila Bay to the east, China Sea to the west, and the province of Zambales to the north. Before this, the region was divided into two parts: the Corregimiento of Mariveles and the Province of Pampanga. The towns of Mariveles, Bagac, Morong and Maragondon, Cavite comprised the Corregimiento of Mariveles that was under the jurisdiction of the Recollect Order of the Roman Catholic Church. The province of Pampanga included the towns of Orion, Pilar, Balanga, Abucay, Samal, Orani, Llana Hermosa and San Juan de Dinalupihan. The latter group was under the charge of the Dominican Order. Limay, the twelfth town of Bataan, was named only in 1917. The topography of the province has made most of the inhabitants farmers or fishermen, with a sprinkling of merchants, factory workers and professionals. Recent years, however, have seen the development of manufacturing industries in the province, particularly the Free Zone in Mariveles, which has brought an influx of workers from other provinces and improved living conditions of its own workers. Historically Bataan is most remembered, along with the island of Corregidor, as the main scene of action in the Philippines during the Second World War. These places are strategic in guarding the entrance to Manila Bay. The surrender of Filipino and American soldiers to overwhelming Japanese forces marked the Fall of Bataan in 1942. A war memorial, Dambana ng Kagitingan, now stands to honor the men who fought and died in that last stand. The diocese comprises the whole civil province of Bataan. It comprises 34 parishes and 2 chaplaincies. 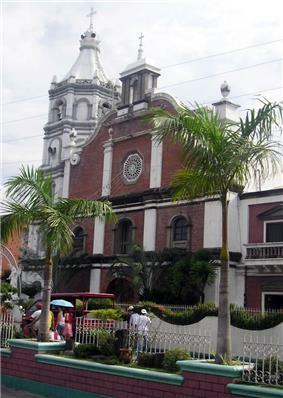 St. Joseph's Cathedral in Aguire Street, Poblacion, Balanga City, serves as the seat of the diocese. The titular patron of the diocese is St. Joseph, Husband of Mary, whose feast day falls on March 19. The city fiesta is celebrated on April 28. The miter symbolizes the pastoral authority of the bishop-elect, which he will be exercising within the province. The three long-stemmed lilies, symbols of Saint Joseph, the patron saint of the Cathedral. According to legend the staves of the many suitors of the Blessed Virgin Mary were gathered in the temple; the staff of Saint Joseph bloomed to signify that he was the one chosen by God to be the head of the Holy Family. Blue signifies peace, justice and tranquility. Saint Joseph was called "just" by the Gospel. He was a placid and silent man, too. The three youths reading books. Bataan, the civil province co-terminus with the Diocese, means the Land of the Youth, the hope of the Fatherland. The books being read by each are respectively marked VIA, meaning Christ The Way; VERITAS, meaning Christ The Truth; and VITA, meaning Christ The Life. Overhead is the golden sun with the letters IHS, meaning Jesus. Our Lord Jesus Christ said, "I am the Light of the world" (John 8:12; 9:5). He is the "real light that comes into the world and shines on all men" (John 1:9). He is the Lamb, the lamp of the Celestial Jerusalem (Revelation 21:23), the Sun of Justice (Malachi 4:2). He also said, "I am The Way, I am The Truth, I am The Life" (John 14:6). So in the light of Christ that is explained by the Church, we must study and follow and live Christ who is the way, the truth and the life. This study entails seriousness, this following of Christ means patience, this living of Christ requires perseverance—virtues signified by the red color.